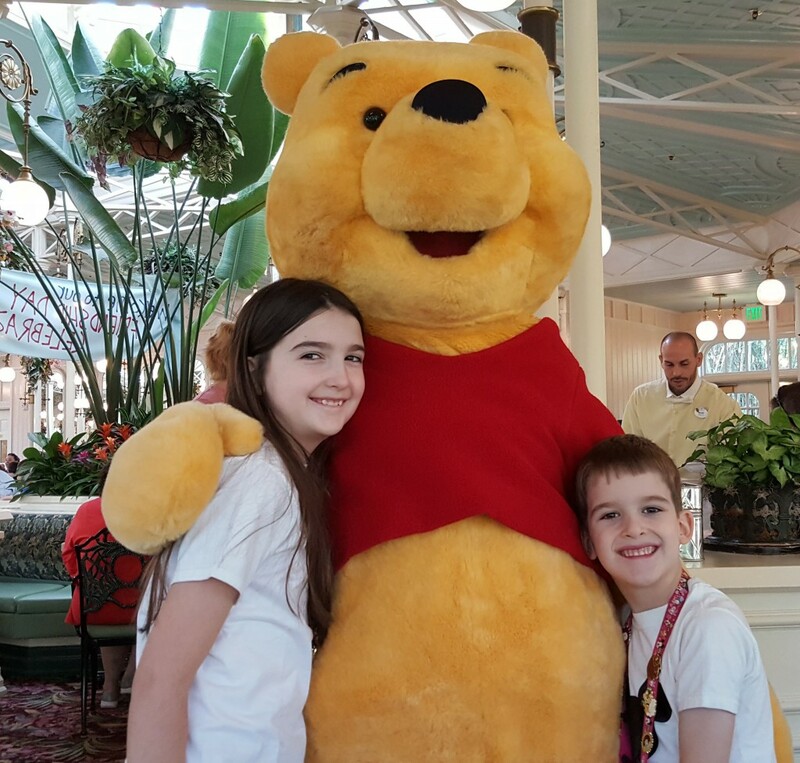 Over the past couple of years we have had a lot of fun visiting Disney theme parks. 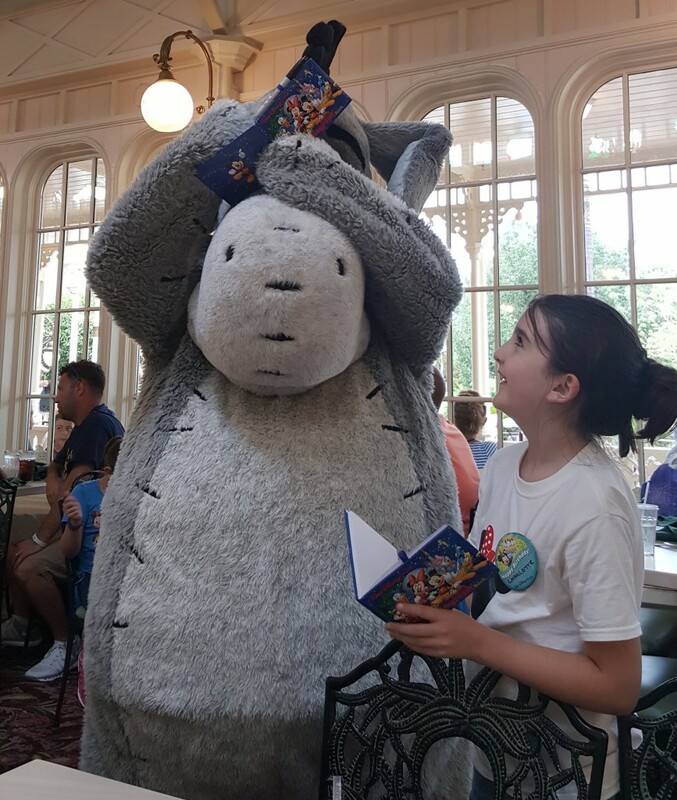 We have enjoyed the attractions, the shows, the characters, the table service meals, the cute snacks, the theming throughout the parks, exploring resorts, swimming in the pools, basically everything! We have also had fun sending family time together and we have made many fantastic memories. 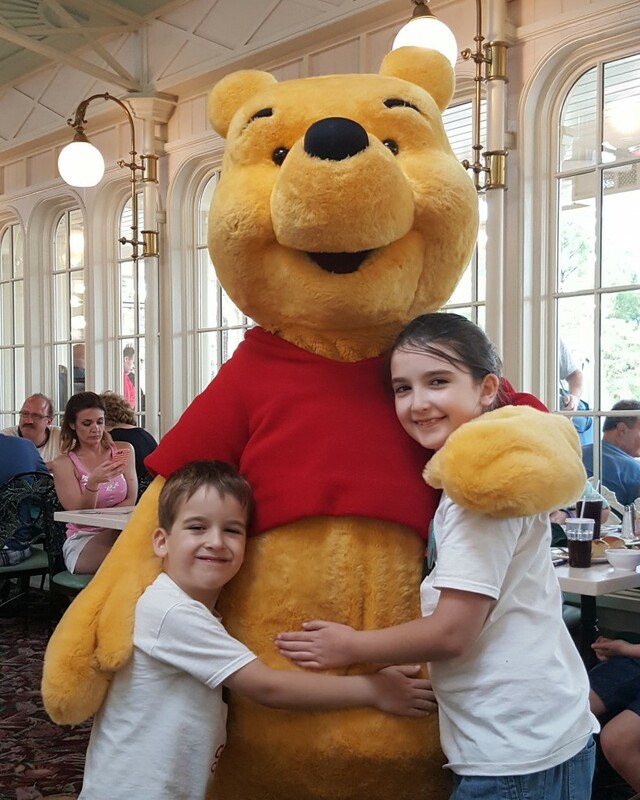 We have hope to have another trip to Walt Disney World coming up soon but until then I decided to look back at some of our memories meeting Winnie the Pooh and Friends. 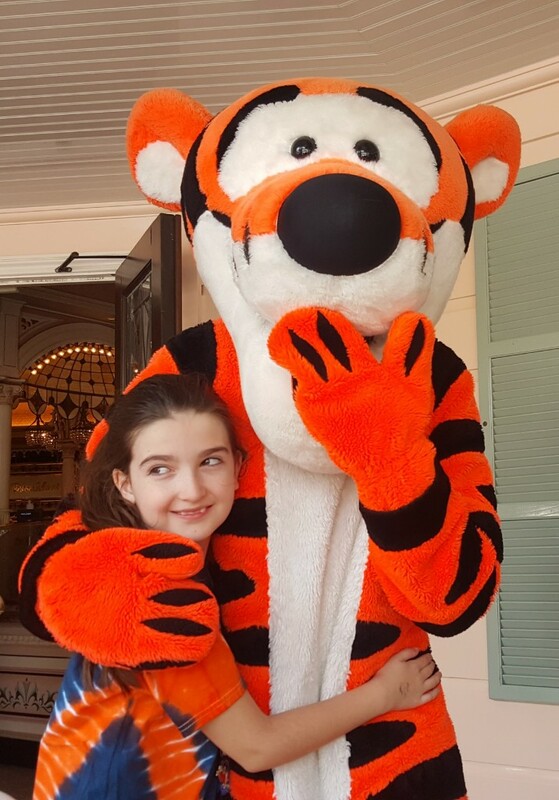 We planned our first visit to Walt Disney World rather last minute when I stumbled on some super cheap flights. Since the trip was planned fewer than 60 days out few dining reservations were available. That turned out to be fine for us – we just went to The Crystal Palace twice, once for dinner and once for breakfast. We liked it and the character interactions were great. On that first visit, our kids were collecting their first character autographs and were really interested in how they signed. 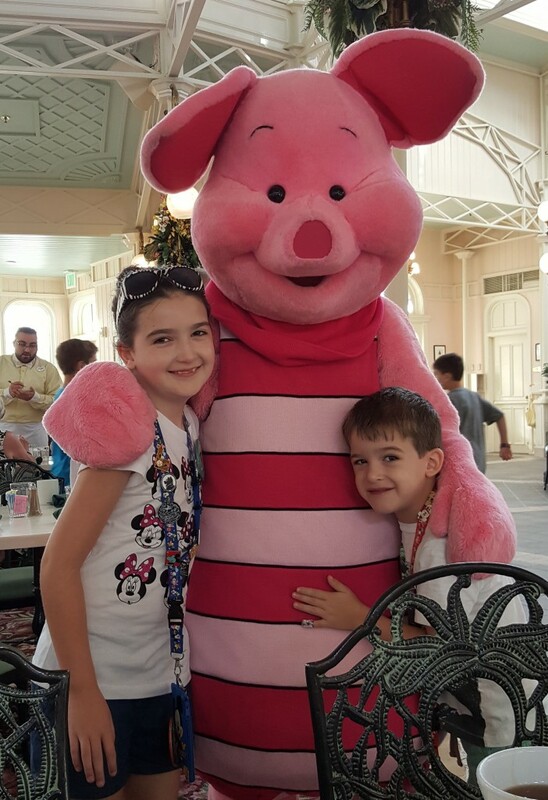 Both of my kids seem so little and young when I look back at this picture with Piglet from our first trip. We had our first Mickey waffles on that trip. We loved them then and we still love them now. 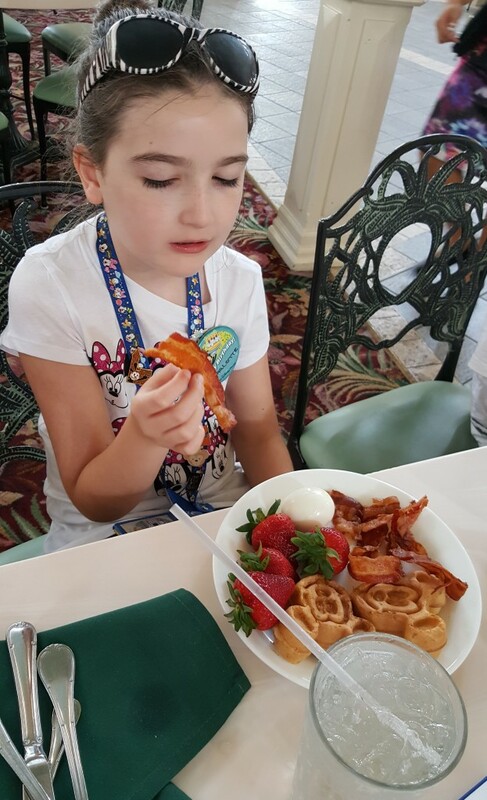 Mickey waffles are a must have on every Disney trip. 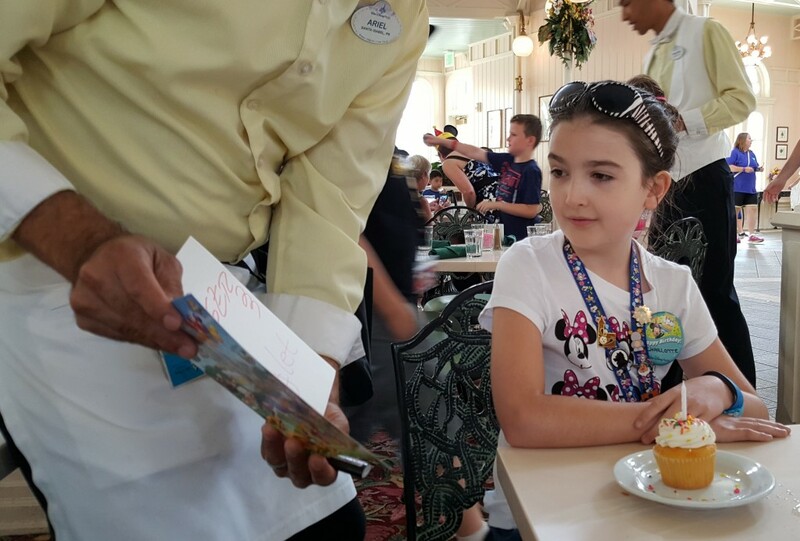 My daughter was celebrating her birthday on that first trip and a kind Cast Member gave her a card signed by Winnie the Pooh and Friends as well as a cupcake for her breakfast dessert. 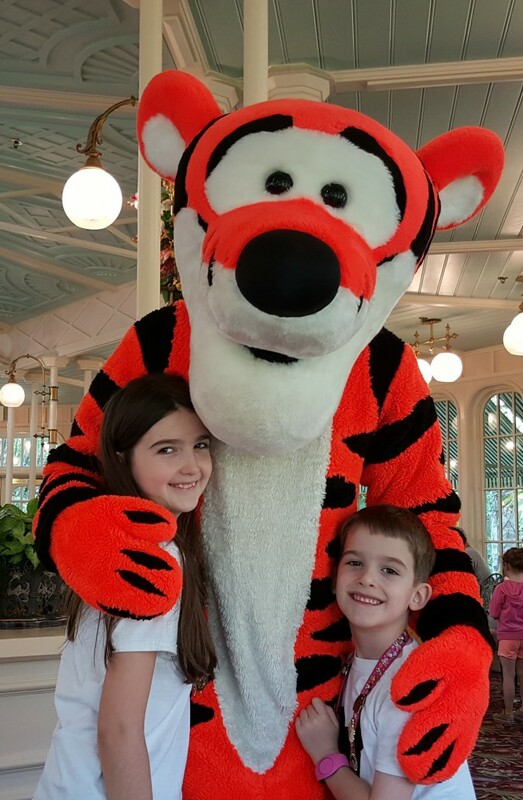 We loved our first trip to Walt Disney World so much that we planned a second trip several months later so that our son could celebrate his birthday there too. We went to Crystal Palace for breakfast again on that trip. 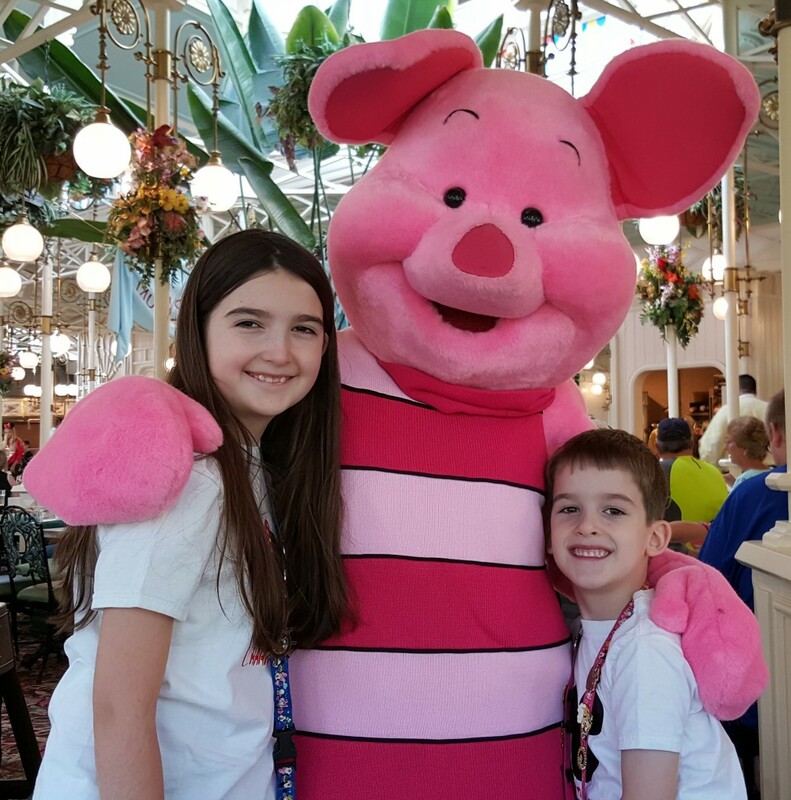 I love this picture of them with Piglet because they all have such pretty smiles. Looking back at the pictures above, I can see that our kids have grown so much over the last couple of years. Time really does fly and kids change quickly! 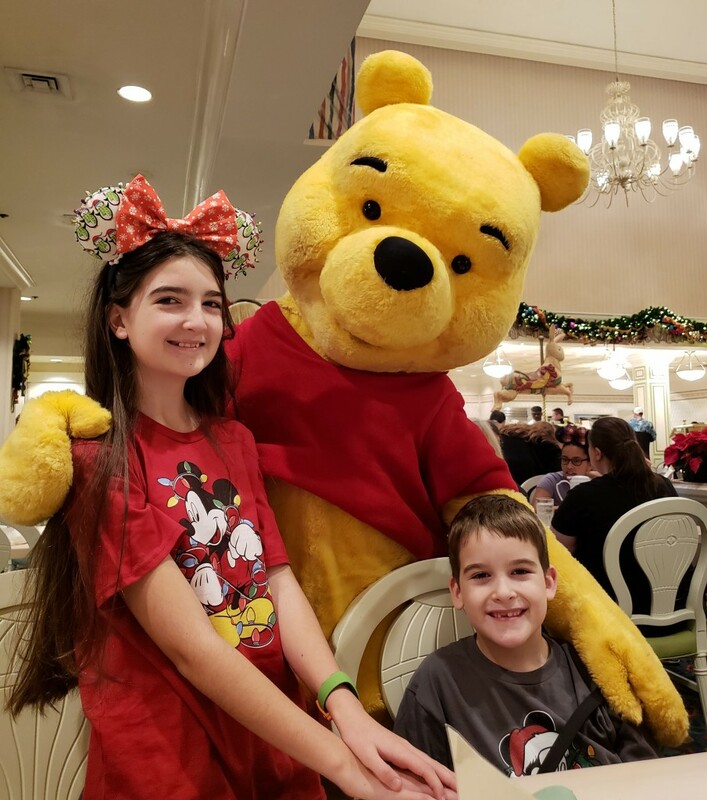 Look how much older they look in the pictures below from our recent trip to Walt Disney World during the holiday season. Noticing how much they have grown makes me even more grateful for the fun trips we have taken, the time we have been able to spend traveling and discovering new places together, as well as all of the memories we have made. 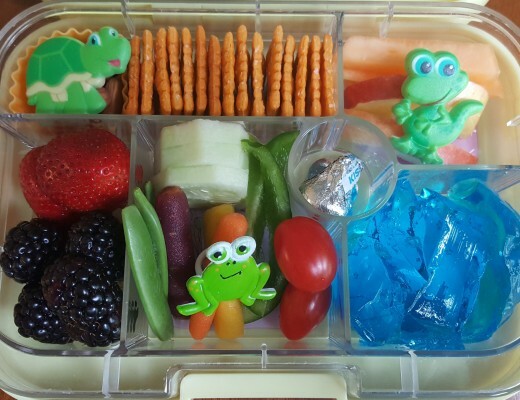 During the school year, I have sometimes been incorporating a few Disney related picks or accents into lunches as a fun way to recall the good times we have had in the Disney Parks. 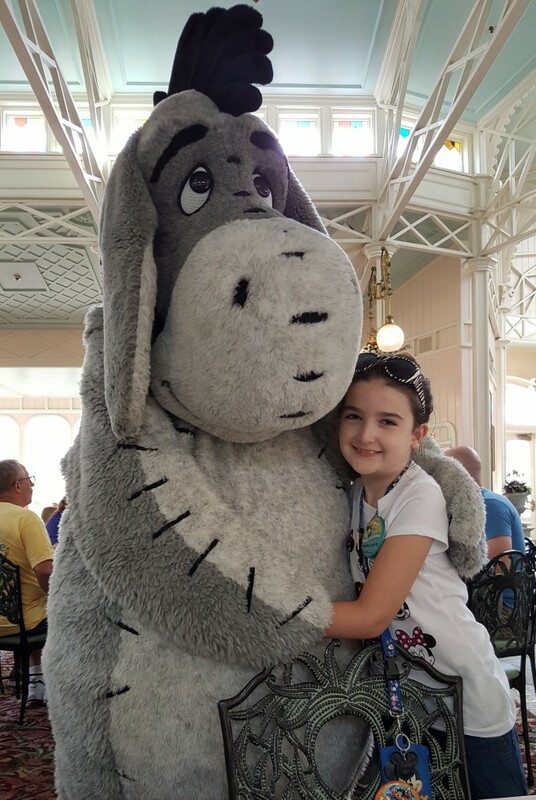 We all enjoy recalling a special day we had together, the first time we rode a certain attraction, tried a specific restaurant, or met a special character. 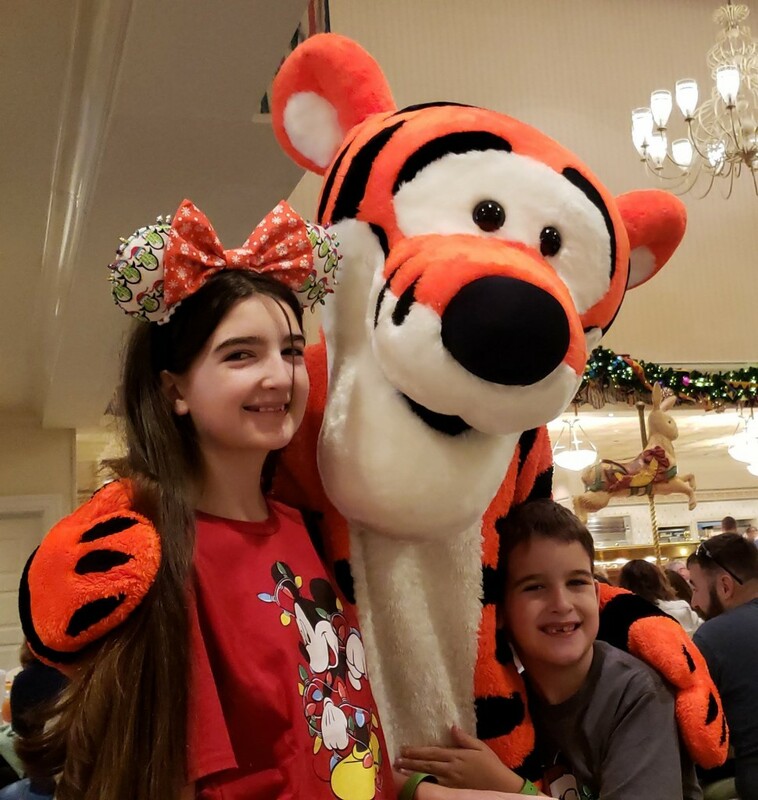 It’s an easy way to brighten lunches and keep some of the Disney Parks fun going even when we are not on vacation. 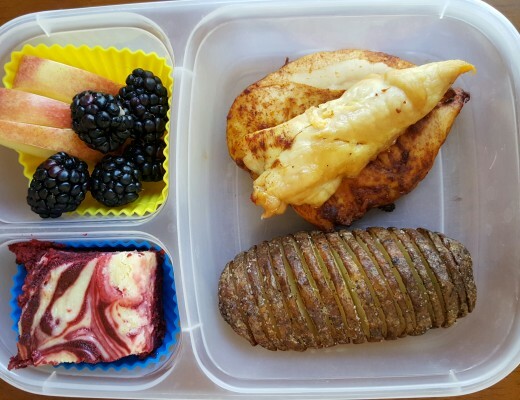 Below are two lunches packed for work in our Planetbox Rovers. 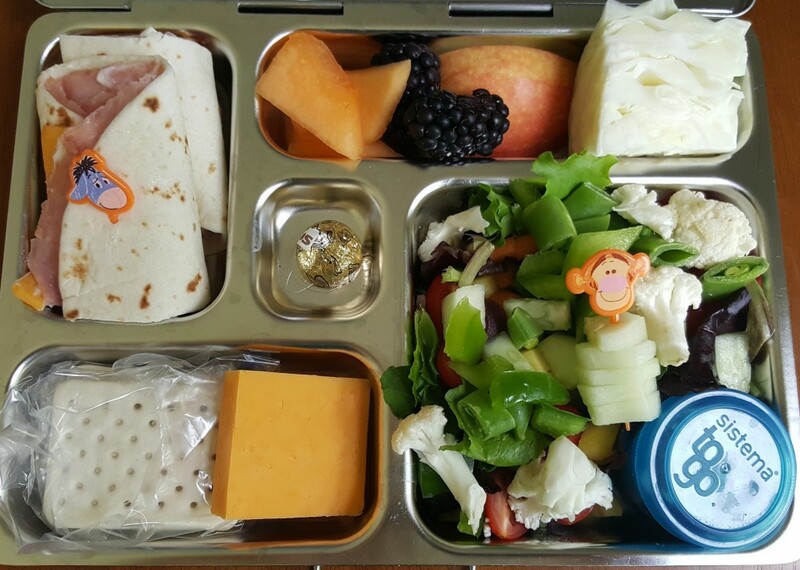 We had ham and cheese wraps secured with Winnie the Pooh picks (that my very kind and thoughtful niece gave me one Christmas), cantaloupe, blackberries, apple slices, a chunk of green cabbage, a spring mix salad with lots of crunchy vegetables, slices of cheddar with crackers, and an almond Hershey kiss. 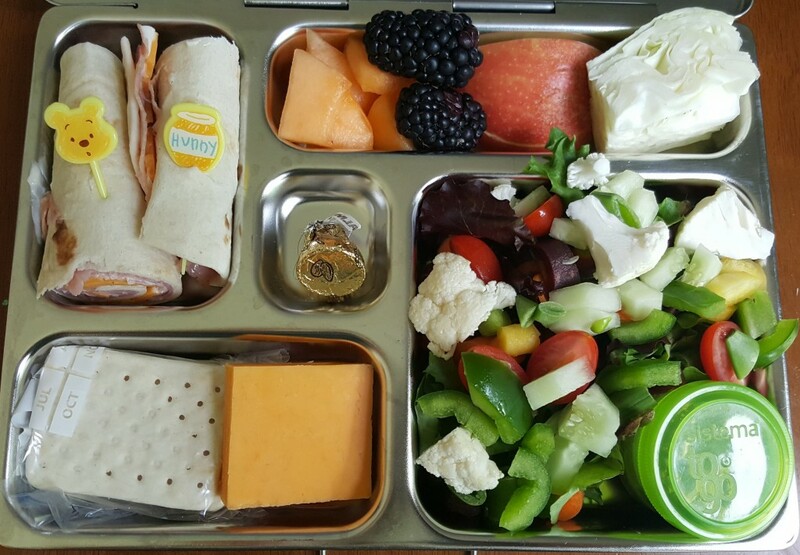 If you are searching for a new lunch box, I highly recommend these Planetboxes as wonderful options. We have had ours for over six years and they are still like new even after being used multiple times a week for all of those years. 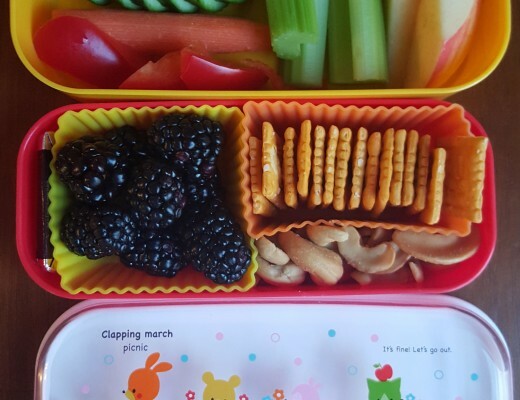 The compartments are super handy for packing multiple foods. The lid is easy to open and close. And, the whole thing can can be cleaned in the dishwasher. Since is it made of metal, you don’t have to worry about staining or warping over time. These Planetboxes are very durable and versatile. Also, the little Sistema dressing pots fit well inside the Planetbox and seal well to holds liquids like dressing and dips. The lunch below was packed in a Planetbox Launch. 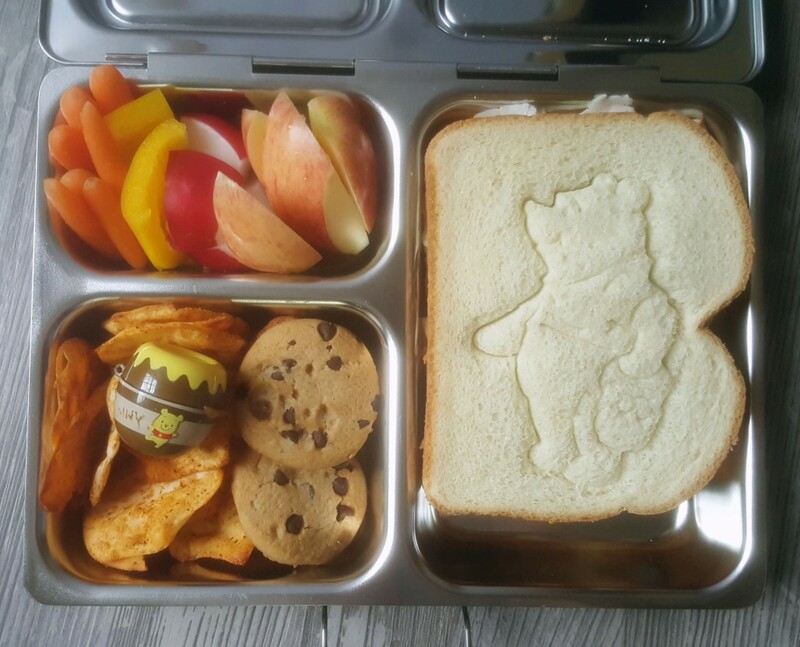 It included a turkey sandwich stamped with a Winnie the Pooh cookie cutter along with veggies, fruit, cracker-chips, and cookies on the side. I got the little honey pot from a friend who went to Tokyo Disney Resort. It held sunflower seeds in this lunch. 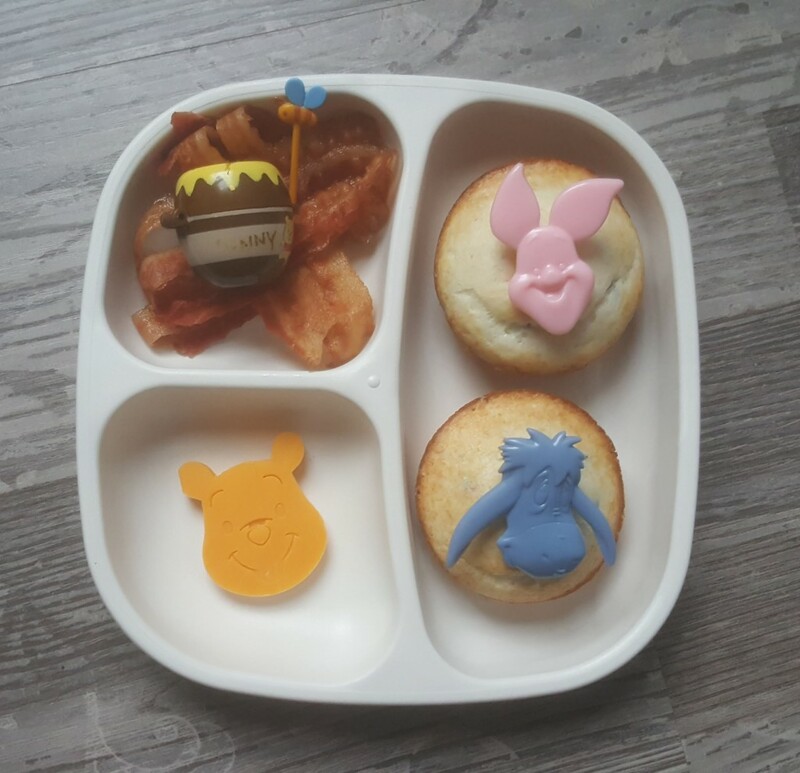 On weekends I sometimes add some fun touches to breakfasts and a couple of Winnie the Pooh breakfasts are shown below. I like to use plates by Re-Play at home because they are durable, hold the types and amount of foods that my kids eat, and wash well in the dishwasher. You can find these at Wal-mart and Whole Foods and they are also available online. The cheese in the breakfast below was imprinted with a cutter similar to this one. The rings in the muffins are like these. 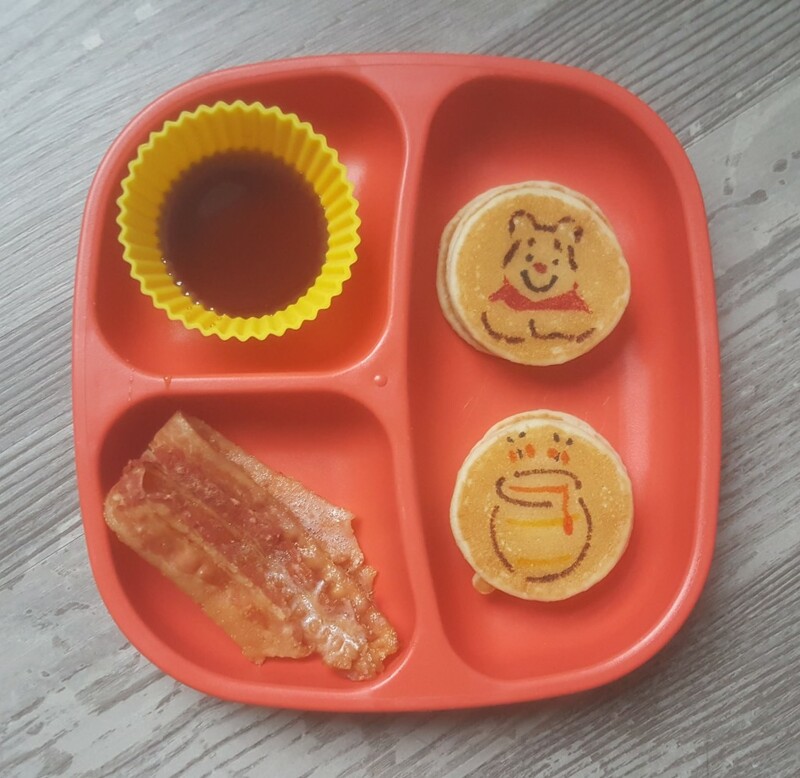 I used food safe markers and stencils from Disney Cakes and Sweets to add details to the mini pancakes below.